Since 1974, the attorneys at Solomon & Relihan have been representing nursing home abuse victims throughout Arizona, including victims of nursing home falls, holding these corporations accountable for the injuries and deaths they cause. According to the Centers for Disease Control and Prevention, approximately 1,800 older adults living in nursing homes die each year from fall-related injuries. Many of these deaths could have been prevented if nursing homes provided the level of care their residents need and deserve. 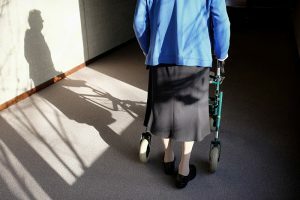 In nursing homes, falls frequently occur because residents are older, suffer from dementia or Alzheimerâ€™s disease, or have chronic conditions that involve weakness and difficulty walking. These residents also tend to have problems with cognitive ability (thinking and memory) that put them at risk of trips, slips, or falls when participating in daily activities. These conditions require special assistance. But, nursing homes often are understaffed. The staff members they do have are typically overworked and underpaid. Too often, they fail to provide the supervision and assistance that residents require. If your loved one has a balance problem or has difficulty walking, the nursing home staff should have a written plan in place to provide assistance while walking. They should never ignore your loved oneâ€™s desire to walk simply because assistance is necessary. If someone you care about has been abused or neglected in a nursing home, take prompt action. If a fall is the result of abuse or neglect, your family may be entitled to considerable compensation. Speak with a nursing home abuse lawyer about your options.